Which is better, an orangery or conservatory? Both orangeries and conservatories differ in terms of design, and each comes with its own unique set of benefits. Castle Conservatories has the experience and knowledge needed to make your home extension project the success it deserves to be. Orangeries are constructed mostly from masonry. Brick orangeries have an ornate lantern roof that delivers illumination into the room below it, making it both bright and private. Modern orangeries feature more glazing and less brick and can include a patio or bi-fold doors. Conservatories are traditionally glazed and create a seamless connection between homes and gardens. But, as with orangeries, these designs can be reversed. Often resulting in a conservatory that looks, feels and performs more like an orangery. Our team will listen to your requirements and design a room you’ll love. Did you know that you can design orangeries online on our website by using our free online tool? It takes just a couple of minutes. So, take a look around one of our stylish room by using our Virtual Reality Tour app on your mobile, tablet, laptop or home PC. Contact us directly on 0208 669 1500 or by emailing info@castlecon.com. Which of our orangeries best fits the scope of your design plans in Surrey? Choose from any of the following three options, then contact us to find out more. Our stylish contemporary orangeries will provide you with a room that feels like a natural extension of your home. Create a living area that is both solid and cosy and which can be used at any time of year for any purpose. 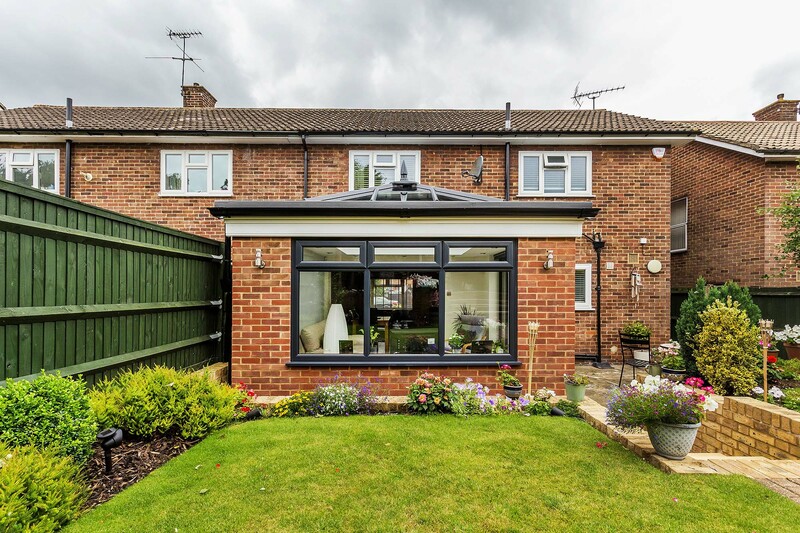 Whatever you use your orangery for, you’ll love the super-insulated columns. These columns improve the thermal efficiency capabilities of masonry columns of the same size by an astonishing 500% and add style to your room, too. A hidden structural goalpost in the roof will allow you to request wider-spanning bi-fold doors or patio doors up to 6.5m in width. This allows you to really open up your home in Surrey to the outdoors and improve access. The stylish lantern roof included with this design option uses fewer bars to deliver more light into the room below it. A glass conservatory roof delivers light and adds a touch of classic charm to your structure. We can even add an aluminium decorative cornice to the outside of your orangery to hide the guttering. Our traditional orangeries include an insulated pelmet that’s infilled with mineral wool to improve internal comfort. The pelmet allows lighting and speakers to be affixed, depending on your design preferences. Make your orangery fit its environment by choosing a colour that complements the architectural style of your home in Surrey. We can also build orangeries in any of the popular building styles. 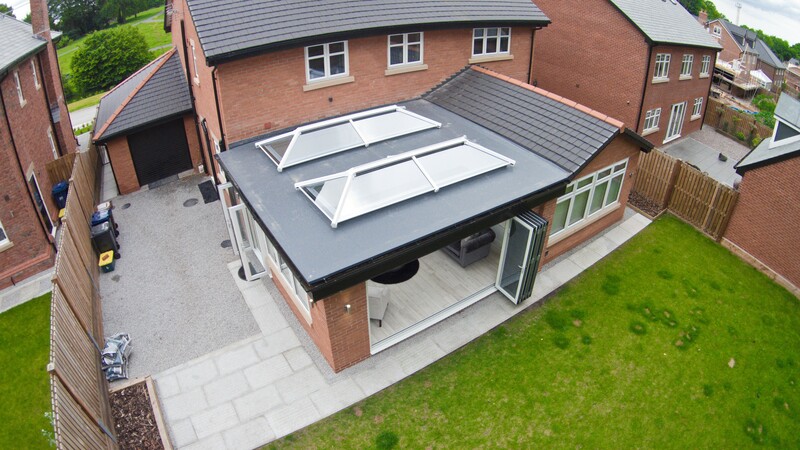 Our lantern orangeries can work in one of two ways: using a flat roof or deck. Whichever of these options you prefer, the minimal use of the frame in the roof ensures it fully illuminates. The lantern itself creates a stunning focal point. A breakfast bar, table or seating area can turn into a feature and as a result, catches the attention of visitors at your Surrey home. As with our contemporary orangeries, wider spans can be achieved. 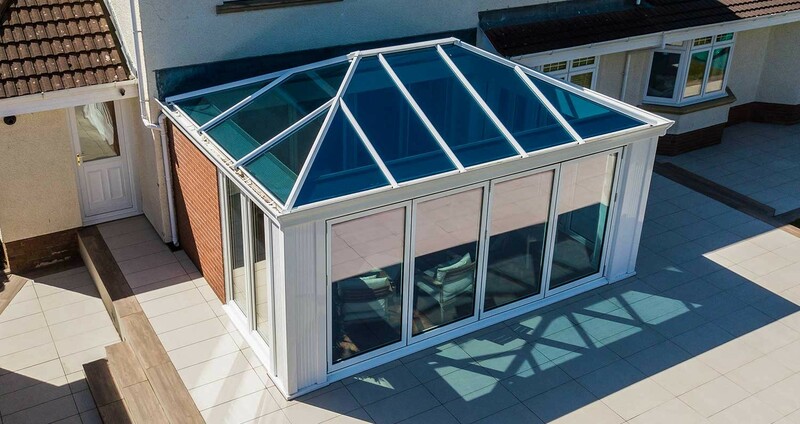 If you frequently entertain and or simply want to enjoy clear views of your garden all year round – our Lantern Orangery is the right choice for your project. Our range of orangeries is built and manufactured by the UK’s leading conservatory manufacturer. These prefabricated systems fitted with minimal fuss at your home in Surrey and with only minor disruption to your daily routine. Once professionally fitted by the Castle Conservatories team, your orangery will make your home more attractive to buyers, who will be able to recognise the development potential offered. Find the inspiration you need by heading over to our orangery design tool. So just enter just a few basic details to get a quote for your project. Alternatively, call or email us to arrange an appointment. You can also look around our rooms by taking our brand new Virtual Reality Tour – using any online device, while at home or when on the move.